Putting my stamp on the world one card at a time. I love taking courses from Online Card Class. Not only do I get to hone my card making skills with new techniques, but I also get to see fabulous projects made by other card makers. The teacher and the students offer so much inspiration and represent so much talent and different artistic views. 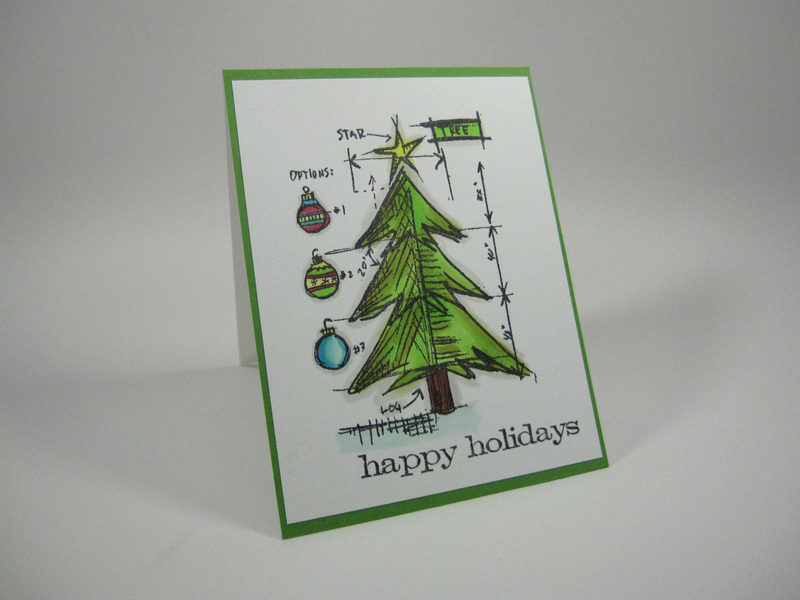 I just finished the 2014 Holiday Card Workshop so I’m presenting my projects from this class on my blog. However, I wasn’t a very good student and didn’t have time (no, my dog didn’t eat my homework) to do all the daily lessons for this class. Anyway, thanks for visiting! Day 1 of class was a class on easy to duplicate cards or cards that are can be made via mass production. I was inspired by a card made by one of the instructors, Debby Hughes. This was my take on her card. 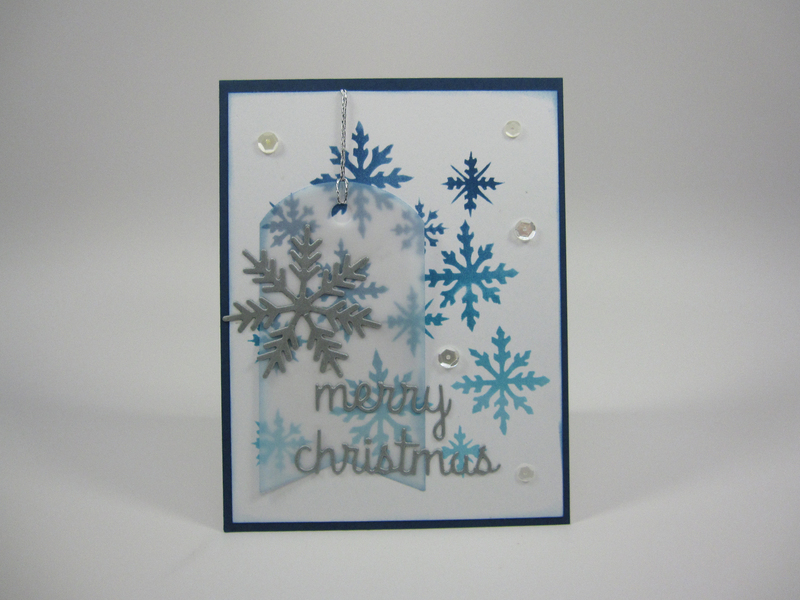 The snowflakes were made using a stencil from Dyan Reaveley and Distress Inks. The tag was made from vellum using a Papertrey Ink fishtail tag die. The snowflake die from my stash (can’t remember the brand) and the merry Christmas sentiment was from Simon Says Stamp Deco Trees craft die set. Both the snowflake and sentiment were cut from silver metallic shimmer paper from my stash. I added clear sequins from Pretty Pink Posh and threaded the vellum tag with silver cord also from my stash. Cardstock used for the card front was 80 lb. Neenah Solar White and PTI Enchanted Evening cardstock for the card base. While this card has a lot of components to it. Each component can be done as a step. e.g. the distress inking, the die-cutting, etc. Debby Hughes’ cards have so much beautiful, gorgeous layering and detail. I’m a novice at this type of style so I choose this as my Day 1 assignment to help me become more familiar with the techniques of a more layered, detailed style. 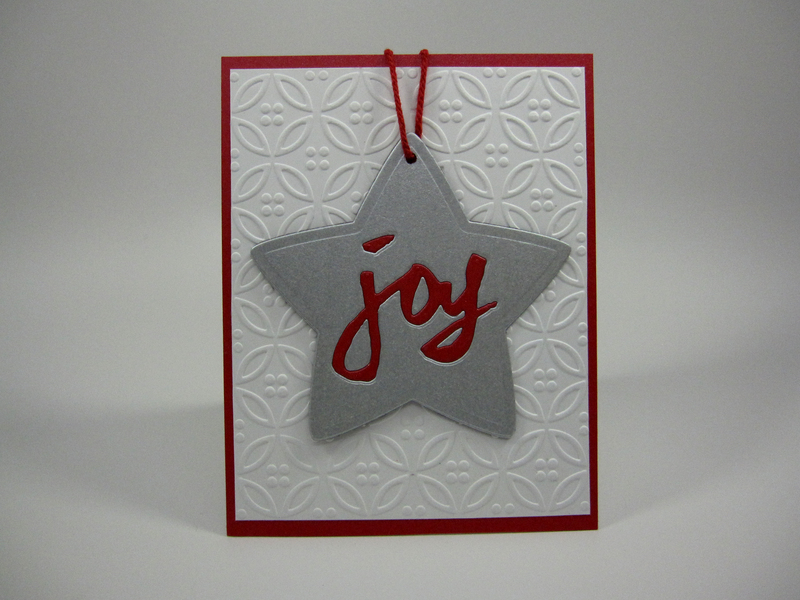 Day 2 of class – The star on the card below can serve as an ornament for the Christmas Tree. I adhered it to the front of the card with removable glue dots. The white dry-embossed background was created using Lifestyle Crafts’ Dainty embossing folder. I mounted the embossed piece onto a red cardstock base and threaded the star ornament with red twine. 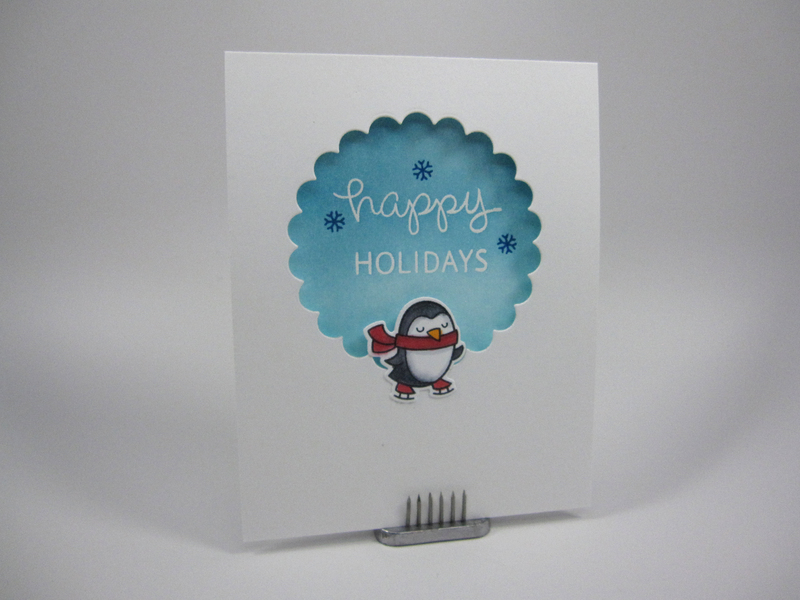 Day 4 – This is a simple one-layer card. I don’t have many cute critters stamps, but this adorable penguin from Lawn Fawn and its matching die make this card so simple and just plain fun to make. I used Copics to color the penguin and scalloped circle dies from Nestabilities to cut out the front and create a coloring mask for the inside of the card. Distress Inks in two kinds of blue were used to color the scalloped area inside this top-folding card. The sentiments (heat embossed with white embossing powder) and little snowflake accents came from the same Lawn Fawn Winter Penguin stamp set. I feel really good about using almost all of the stamped images from this set! Day 6 This card involves coloring with my favorite coloring markers, Copics! Copics are so forgiving and make my simple coloring techniques look more amazing than they really are. The stamped image is from Tim Holtz’s blueprint collection. I think its called Blueprint Christmas Tree or something like that. The sentiment is also from Tim Holtz. Well this completes my work from OCC Holiday Card Workshop 2014! Thanks and I hope you like my cards. This entry was posted in Holiday Cards, Online Card Classes. Bookmark the permalink. my diary of handmade cards and other stuff. I don't know where life will take me, but while I'm here, I think I'll write about the journey.